Police guitarist Andy Summers will be on hand at the TASCHEN Store in New York City to sign copies of his book I'll Be Watching You: Inside the Police, 1980-83. The book, described by the publisher as “somewhere between photojournalism and an illustrated diary”, follows The Police around the globe between 1980 and 1983. The event will take place November 01, 2007, 7pm-9pm. A limited-edition printing of some of Andy's rock-n-roll photography will available be for sale in the gallery. The event is free and open to the public. The TASCHEN store is located at 107 Greene Street, New York. 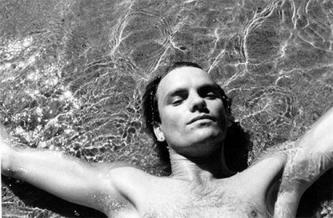 The image posted here is of Sting by Andy Summers. Andy Summers is listed on page 2 of my celebrity artists list.